A Heads-Up Prenotification calls or emails can be a helpful line of communication for you and your clients. Three lawn care operators share their preferred methods for automated prenotifications. In the late 1990s, Jim Zylstra received an automated call from his dentist reminding him of an upcoming appointment. The owner of Tuff Turf Molebusters in Byron Center, Mich., was so impressed by this service that he quickly began researching how to incorporate it into his own business. While the technology has certainly improved since then, prenotifying customers of their appointments is more important than ever—and is even mandated in some cases. Lawn care operators (LCOs) are using automated calls, texts and emails to prevent last-minute cancellations and to keep their technicians’ routes on schedule. At Tuff Turf Molebusters, customers can choose to be contacted via call, text or email. Most prefer email. Zylstra uses Real Green Systems software for his prenotifications and says it costs him 7 cents per call, or about $225-250 per month. Tuff Turf Molebusters has revenue of $2 million and offers 50 percent lawn care services and 50 percent pest control services to an 85 percent residential, 15 percent commercial clientele. “If technicians can find out in advance that a customer’s street is under construction, they’re having a neighborhood garage sale or they’re doing a home construction project, (the notification) kind of pays for itself,” Zylstra says. The firm gives its customers a two-day window for technicians to complete their appointment. While Zylstra says this approach gives the company some flexibility if there is an issue such as inclement weather, an ill technician or an equipment malfunction, it also can make schedules more complicated if the unforeseen problem persists. This is the first time Zylstra has utilized a pay-per-use prenotification service. He recommends that LCOs purchase their system outright if they can find an affordable way to do so because there are other ways to use it. For example, in the past, he has done blasts promoting special deals or new services. Senske Services first implemented an automated call service in 2008 and added text and email options in 2013. When new customers come on board, they choose how they would like to be contacted, says Chuck Williams, the company’s customer experience manager. Most clients prefer text or email, he says, adding that a few still prefer an old-fashioned phone call from a Senske representative. The company even has a few customers who ask to receive a postcard in the mail, a request Williams says the company is happy to accommodate. 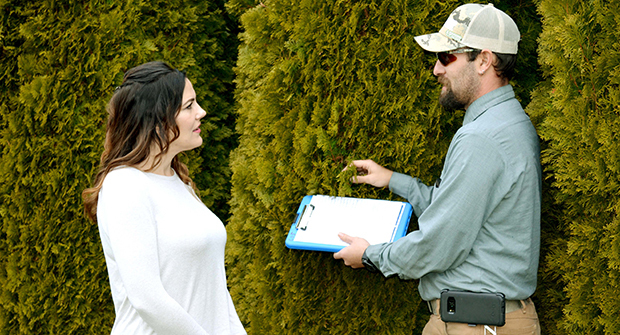 Senske Services, headquartered in Kennewick, Wash., is a $34-million company that provides 55 percent lawn/tree care, 20 percent maintenance, 20 percent pest control and 5 percent holiday décor to a 70 percent residential, 30 percent commercial clientele. Senske’s text and email notifications are automated and integrated into the company’s customer relationship management system. The company uses a third-party service to manage its automated calls. Williams says the service costs “pennies on the dollar” and that the more automated the process, the less it costs. He says some contractors believe a drawback to providing prenotifications is that it gives the customer more control over the way the company does business. Williams adds that cancellations and rescheduled appointments can make it trickier for technicians to complete their predetermined routes in a timely manner. For LCOs interested in offering automated prenotification services, Williams urges them to customize the program to fit their needs. For example, when the firm first launched its text notification service, the messages were not long enough to specify what service the client could expect to be performed. Williams says the company worked with its text provider to expand the character limit for its messages so the customer could receive all the relevant information. Jesse Smith, president of Royal Greens Professional Lawn Care in Frederick, Md., has always offered call-ahead services upon request. But in the past year, Smith switched from phone calls to emails because he says they’re easier to track. Another benefit of email, Smith says, is the company can convey the necessary information in a clear and concise way. Royal Greens is a $1.1-million company that provides 80 percent lawn care, 15 percent pest control and 5 percent tree care services to a 90 percent residential, 10 percent commercial clientele. Royal Greens’ automated emails are integrated into the company’s Real Green Systems software. Smith says it costs 15 cents per email, and 10-15 percent of his clients opt to receive them. Most of the customers who receive the prenotification have a specific reason they want to know when a technician is going to be on their property, such as a locked gate or a dog in the yard. Smith says the biggest drawback to offering the email service is making sure they have the customer’s most accessible email address on file. For example, he says some customers who provide their work email address don’t see messages sent after business hours until the next day. However, he was pleasantly surprised to see customers using the emails as a way to stay in touch with the company in between their services.